This project was born a long time ago, when I first got my hands on Raspberry Pi and started exploring physical computing. My first attempts, back in 2013, resulted in few corrupted temperature sensors, lots of tangled cable and few lines of Python code. Now I reminded myself of the dust covered project and decided to take it further. 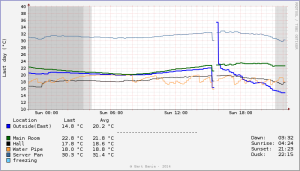 My initial idea was simply to log temperatures into Round Robin Database Tool (RRDTool) and create simple graphs. While developing the web front-end for my project, I've decided to make more of it, added some extra features to graphs, polished website appearance and optimized data collection. Alongside, I've created a sister project based on MySQL database for data collection and AmCharts for visualization. Both work well, as you can see here: Temperatue Log. One of the easiest sensors to connect to a Raspberry Pi is the DS18B20 digital thermometer. It's optput is read through a multi-device 1-wire bus that is directly supported by a driver in the Linux kernel. Several sensors can be connected in parallel to the same data-wire and read individually over the bus interface by their hard-coded IDs. An extensive tutorial on connecting the sensor to Raspberry Pi was written by Matthew Kirk. For my project I've used 5 sensors on ~20m of cable. While lots of tutorials advice of using 4k7â„¦ resistor (only one! ), because of the length of my network (or "network weight"), I've ended up using 2kâ„¦ resistor for better readings. I've soldered pin rows onto Humble Pi prototyping board for convenience of (re)attaching sensors. The output is a list of sensor addresses on the 1-Wire network. The temperature is the last readout after 't=' in milidegrees Celsius. Since I don't need Fahrenheit readouts, I didn't include the conversion in my code. However, if you need the temperature in F instead of Celsius (or both), there are numerous tutorials on the wide web on this subject. Now that I could read the temperature from the sensors I needed a way to store the information. Round Robin Database is perfect for this task. It's a circular database that lets you store a predefined amount of data. After initial creation it is as big as it will ever get and just contains "unknown" data. This creates a database with a base data interval of 1m (-step 60), with a data range of -50 to +50 (degrees C), and some calculated averages for 6hours, day, week, month and year. To get more of RRDTool, read an extensive tutorial. Now, to pass sensor readings to the database, I used Python again. At the top of the script I've got pre-defined changeable variables, such as paths and colour codes for my convenience. This particular example creates a graph for the last 6 hours for all five sensors. Apart from a plain graph, I wanted to add a bit of flavour to it by marking day and night times, as well as dusk based on Civil twilight calculations. Instead of writing my own code, I've decided to make it simpler and use an external tool. A great small C program for calculating sunrise and sunset came in hand. The website itself is hosted on my main sever. All the files are dynamically transferred from Raspberry Pi. This ensures me the SD card would last longer and no data would be lost. Apart from that, it ensures the website runs smooth without any interrupts. the source for the website is available through Git repository.